Constructed fish barrier that functions to protect a conservation population of native Colorado River cutthroat trout from unwanted downstream invaders (disease organisms and competitive trout species). Division of Wildlife. Matt Kondratieff, Colorado Parks and Wildlife. Photo taken: 6/3/2009. COLORADO RURAL WATER ASSOCIATION (CDPHE) Facility Classification Stakeholder Meetings: CDPHE is hosting stakeholder meetings to discuss drafts developed from work group meetings proposed to update the facility classification sections of Regulation 100 - Water and Wastewater Facility Operator Certification Requirements. This could affect your facility classification in the future. You are encouraged to stay informed. The listed meetings are all outreach meetings with the same content. While you are welcome to attend more than one, the content will be the same. Meeting questions and discussion will vary depending on participants. April 18th, 2018 Web/conference call only --- 1:00 - 2:30 pm. Details will be updated at least one week before meeting date. APRIL 18th, 2018: The Center for Watershed Protection is hosting the 2018 National Watershed and Stormwater Conference, which is designed for water management from all sectors, practitioners, regulators, and water and sewer authorities, and will present case studies and best practices as well as address cross cutting issues and emerging trends. This will take place online and at remote hub locations. Questions can be answered by emailing: center@cwp.org, or calling 410-461-8323. For more on the Center for Watershed Protection, click HERE. APRIL 21st, 2018: Fryingpan River Cleanup! Help clean up one of the most beautiful stretches of river in the country! Volunteers of all ages welcome. Join them for a free breakfast before cleaning up a 1-mile section of the river. Prizes for: Best of Trash, Most Toxic, Most Useful, Most Unusual Trash, and Best Photo. Learn more and register HERE. APRIL 21st, 2018: River Run Park Clean Up! (12-3pm)Starting at the River Run Park, which is a newly improved hot-spot for river surfing, we'll be collecting trash along both the South Platte River and Bear Creek. This event is a great opportunity for families, local community members, residents, and service groups to get outdoors while helping to keep a section of our urban waters clean! To signup, email Makalah@GroundworkColorado.org before Friday, April 20th. APRIL 21st, 2018: High School GLC Spring RiverSweep. Calling all high school students! Come on down to downtown Denver on Earth Day weekend and join hundreds of other volunteers as we get our parks ready for spring by removing trash from our parks! Food will be provided, and you'll earn service hours for your time with us. Register HERE. APRIL 26th, 2018: CREEC Meeting and Special Speakers. (2-4pm) Colorado School of Mines is having a meeting with special speaker Nohemi Almaraz and Sydney Ulliman which will be talking about "Biological treatment of oil and gas produced water: Implications on the emergence of iodinated disinfection byproducts" and "Improving UV/H2O2 performance following tertiary treatment of municipal wastewater." Please RSVP if you are interested by contacting wbattagl@usgs.gov. APRIL 26th-27th, 2018: The Inaugural Water in the West Symposium, hosted by Colorado State University (CSU), will bring more than 400 leaders in water research, agriculture, policy, conservation, and education to Denver. CSU and other partners have invested in creating a state-of-the-art Water Resources Center (WRC) to be housed at the National Western Center (WRC). The WRC will offer a collaborative space for partners from agriculture, utilities, academics, and recreational water stakeholders in a state-of-the-art facility. The WRC will focus on policy, innovation, education, and research, and will be capable of hosting multi-disciplinary programs and water conferences, as well as attracting students of all ages. The Symposium will focus on engaging experts and leaders in thoughtful conversations and creating impact through the WRC. Find full details and a link to register HERE. APRIL 29th-May 1st, 2018: The 2nd Annual Next Generation Water Summit at the Santa Fe Community Convention Center, 201 W Marcy St, Santa Fe, NM. The Summit focuses on water conservation and water reuse in the arid Southwest. It brings together builders, designers, architects and water professionals to share best practices and brainstorm new ones through charrettes. In 2018, their featured keynote speaker will be Jonathan Overpeck. Overpeck’s visionary work has been at the forefront of the heated climate change public debates and identifying the risks to managing water resources, providing valuable insights into past climate variability and change in the Southwest. He will present on the Climate Change forecasted impact to the Colorado River flows. There are over 40 unique sessions planned with speakers from AZ, CA, CO, NM, TX. On the morning of May 1, they will hold two charrettes, where they will have multiple stakeholders dive into a challenging topic. These charrettes will have very limited seating, so sign up today! Learn more and register HERE. MAY 2nd-4th, 2018: San Juan Mining and Reclamation Conference - Planning for Resiliency will be held in Creede, Colorado. The format of this conference encourages discussions of how the mining and reclamation community can plan for potential disasters and invites bold and frank conversations about topics that have challenged you, may be considered taboo, or can be uncomfortable to share. Topic examples include, but are not limited to: Longevity of mines; Lifetime of watershed groups; Risk assessment, tolerance, and mitigation; Effectively communicating risk; Fiduciary responsibility and abandoned mines (Good Samaritan Law); Scenario planning; Adaptive management; Environmental justice; New regulations and their impact; Planning for natural disasters and severe weather events; Changes in relationships, partners and stakeholders. Click HERE to learn more. MAY 8th, 2018: Mesa County State of the River Seminar & Dinner, a complimentary chili dinner, and learn about this year's snowpack and reservoir operations, current Colorado River Basin issues, and potential impacts of the dry year in the Grand Valley. This event is free is you RSVP HERE. Read more about the Conservation Futures Project Summit HERE. MAY 29th-JUNE 1st, 2018: The Society of Wetland Scientists 2018 Annual Meeting will be held at the Hilton Denver City Center in Denver, Colorado. This unique meeting is themed “Wetland Science: Integrating Research, Practice, and Policy – An Exchange of Expertise.” Reserve your spot to network and build professional connections with the highest level of wetland professionals at the 2018 Annual Meeting. Simply complete and return the Exhibitor Agreement to reserve your booth today! Agreements must be received by April 30, 2018. Click HERE for more information. 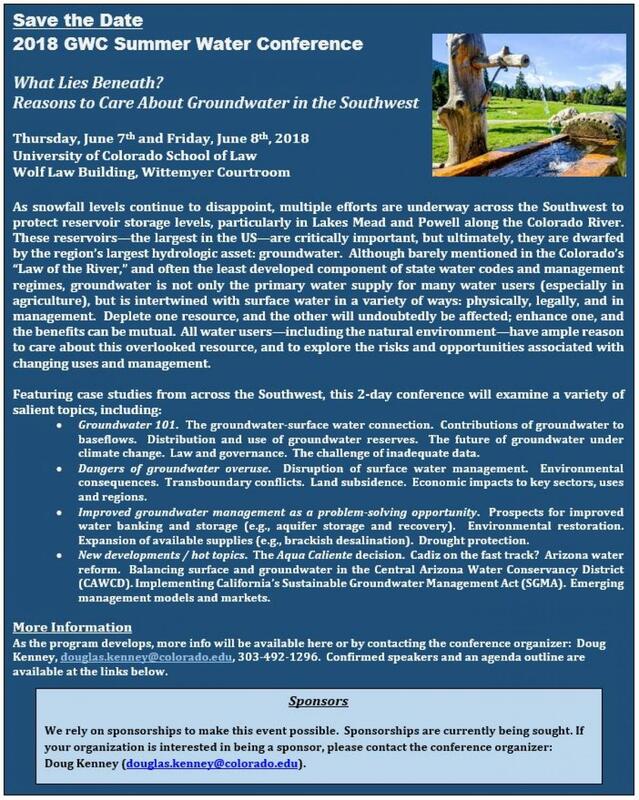 JUNE 7th-8th, 2018: Join GWC Summer Water Conference, "What Lies Beneath? Reasons to Care About Groundwater in the Southwest." at the University of Colorado School of Law. Read specific details HERE. JUNE 20th - 21st, 2018: Pawnee Butte Seed Company 2018 Grass Tour. Working with the Colorado Section - Society of Range Management, West Greeley Conservation District, and Jordan Angus, together they have a great tour planned for you. Starting Wednesday afternoon: enjoy a tour of Emmett Jordan's Ranch in Briggsdale. Jordan received the 2017 Colorado Section SRM Excellence in Rangeland Conservation award. Following the tour there will be a BBQ at the beautiful West Greeley Conservation Districts Houston Gardens. Thursday join them for a day all about water. Visit different locations in Northern Colorado and see the different ways water is used in Weld County and its different forms. If you would like to join in please email becca@pawneebuttesseed.com to register! AUGUST 6th, 2018: Reclaimed Water - Regulation 84 Hearing Hosted by Colorado Water Quality Control Division. A public hearing is being held to review proposed regulatory changes to Reclaimed Water Control Regulation 84 at CDPHE Main Campus at in Brown Hall at 1600 Illinois St, Golden, CO 80401. For more details about other WQCC Rule-making Proceeding, click HERE. SEPTEMBER 10th-12th, 2018: 2018 Colorado Open Space Alliance (COSA) conference. Do you have open space, natural resource management, or conservation expertise that you’d like to share? They are seeking presentations for the conference, which is themed “Ripple by Ripple, Water is the Driving Force in Nature.” Read more about this HERE. OCTOBER 9th - 11th, 2018: SAVE THE DATE - 13th Annual Sustaining Colorado Watersheds Conference. The Color of Water: Exploring the Spectrum, Westin Riverfront Resort, Avon, CO. Don't miss the premier watershed conference in Colorado. Expanding cooperation and collaboration throughout Colorado in natural resource conservation, protection and enhancement by informing participants about new issues and innovative projects and through invaluable networking. Stay tuned at SCW Conference 2018. OCTOBER 24th-25th, 2018: 29th Annual South Platte Forum at the Embassy Suites in Loveland, CO. The conference will feature an exciting lineup of speakers and topics, and a great opportunity to network. This year the South Platte Forum is accepting speaker applications! If you have a topic that you would like to present at the conference, please submit an application for the Committee to review by May 1st, 2018. Find the list of speakers and their bios HERE, and all general and pertinent information and links HERE.